Come experience the Holiday Inn Express Hotel Roswell. Our completely renovated property is conveniently located in the heart of Roswell. Home of the world famous New Mexico Military Institute &reg where leaders are made. 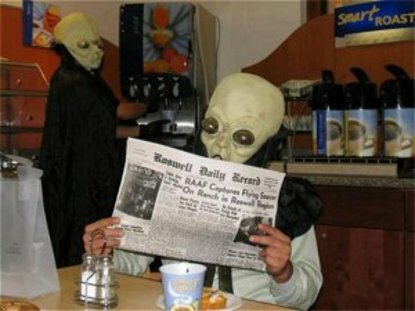 And Roswell&regs own International UFO Museum and Research Center and Annual Alien festival celebration. The Holiday Inn Express Hotel Roswell offers newly renovated deluxe guest rooms, and extended stay suites. Rooms completely designed around the business persons needs and includes in room voice mail message service, dual modular phone jacks, free wireless high speed Internet, dry cleaning service, in house guest laundry room, cable TV, coffee makers, hairdryers, and individual climate control. Extended Stay Suites also include cook top dishwasher, full size refrigerator freezer, microwave, flat screen TV and kitchen table with living room sitting areas. Shuttle service to and from airport upon availability, Monday through Friday only. This hotel is committed to providing accessible facilities under the American Disabilities Act. If your accessibility needs are not met, please contact the Hotel Manager on Duty. Should you require additional information regarding accessible facilities for guests with disabilities, please call 1-800-Holiday (U.S. and Canada) or contact the hotel directly. For the hearing impaired, TDD service is available at 1-800-238-5544 within the U.S. and Canada.